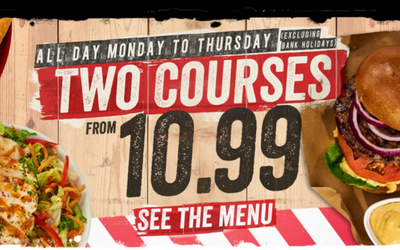 At TGI Friday’s there is always the ‘end of the week’ vibe with a brilliant selection of food and drink available and some exciting offers to boot. So, catch up with the latest offers and new additions to their menu. Take a look at the menu to see what you can get with this great offer. This excludes bank holidays. There are three menu choices you can go for. The Downtown selection at £10.99, Midtown at £13.99 and upgrade to the Uptown selection for £16.99. There is something for everyone at TGI Friday’s. The endless appetisers menu is available to anyone with the rewards app, from Sunday to Thursday anytime from 7pm. All you need to do is download the TGI Fridays rewards app and head to the endless appetisers tab at the top to unlock your unique code. Then, check out the menu and get ready to order! Show your server your code when ordering and enjoy plate after plate of appetisers. You choose between one type of appetiser for £9.99 and keep refilling, or £12.99 to keep getting another choice each time you ask for a refill. So, you can choose from loaded nachos, mozzarella dippers, avocado humous, loaded skins, chicken wings, loaded fries and loads more.